Posted in Physik. Tags: physik, präsentation, unterricht on 28. Mai 2018 by Martin Döpel. Posted in Uncategorized on 24. Mai 2018 by Martin Döpel. There is a great magazine, I just discovered. It's called "Hello World" and is published by the Raspberry Pi Foundation, the guys, who brought us the small computer for computer education. The ePaper subscription is free of charge and the back issues can be downloaded for free as well. I know, the answer to the question what programming language should be learned is rather silly. It depends on what you want to do. Nevertheless, school teachers sometimes have to pick a programming language to teach their students. Which one would you choose? You may pick up to three and can add suggestions, if you like. What programming languages would you recommend for beginners in a school context? Posted in Informatik. Tags: beginners, poll, programming languages on 5. März 2018 by Martin Döpel. 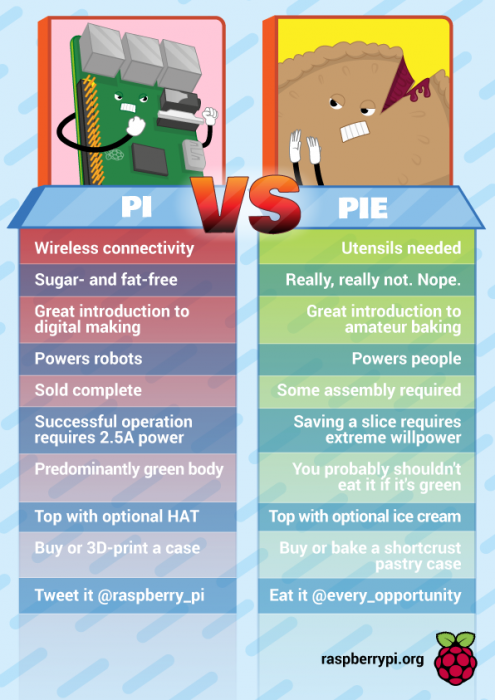 As this week is British Pie Week, the makers of Raspberry Pie made this useful comparison between the two Pi(e)s.
Ich mag es ja, wenn mehrere Fachrichtungen zusammenkommen. Die Seite "On this Day" vom Institute of Physics bietet einen Kalender mit wichtigen Daten rund um die Physik. Interesting study, I wonder whether there is a neuroscientific reason for this too. It would actually make sense. Posted in Mathematik, Quickpost on 9. November 2017 by Martin Döpel.